It can be difficult coming out of the shadow of famous parents, but Holden Seguso has managed to quickly make a name for himself. The son of Robert Seguso -- an NCAA Champion and Olympic Gold Medalist -- and Carling Bassett Seguso -- who turned pro at 14 and had an outstanding tennis career while also working as a top model -- has proven that he can play and win with the best. 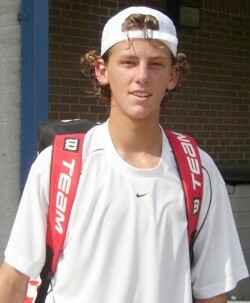 Holden took full advantage of a wildcard at the 2005 U.S. Open Junior Championships. He upset the No. 7 player in the world (Niels Desein) in the first round and won another round against a top player (Lukas Lacko) before falling to Ryan Sweeting, who was this year's champion. To make matters more exciting (or is it more complicated? ), Holden did this while his parents were both playing U.S. Open events of their own. (Robert was actually a finalist in the Men's 35 Doubles Masters). The family was used to the excitement and the eldest son was the one they wanted to garner the attention he deserved. A hard-hitter with a great serve and volley game, Holden has been especially successful in doubles events. This past spring he (and doubles partner Philip Bester) won the title at the USTA International Spring Championships. The two also played to the semis at the 2004 Eddie Herr Internationals and quarters at this year's Canadian Open. Also this year, Holden was a semifinalist at the Genting Malaysian International and the Luxilon Cup, where he upset third seeded Jesse Levine. Holden has had much success despite being sidelined during a lot of the past few years with injuries. He is healthy now and the tennis world will be seeing a lot of the 17 year old Floridian in the years to come. I talked to Holden during the U.S. Open, after his loss.